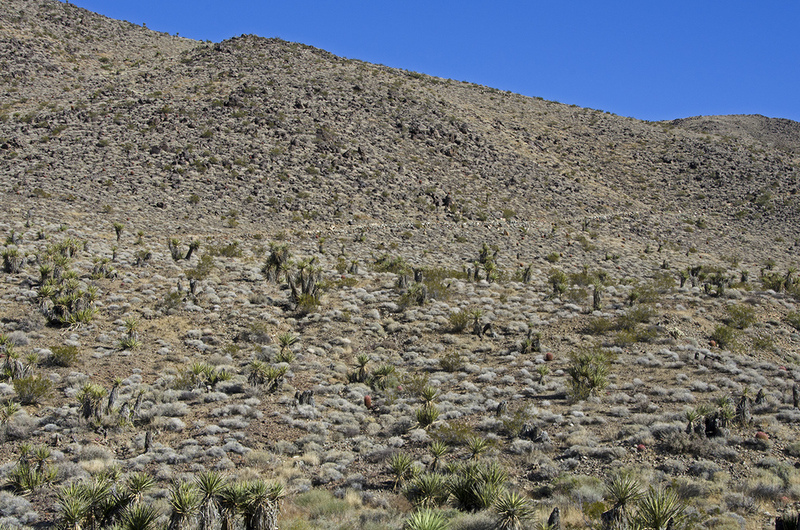 I was heading out into the backcountry of Joshua Tree, to a place I'd never been before. 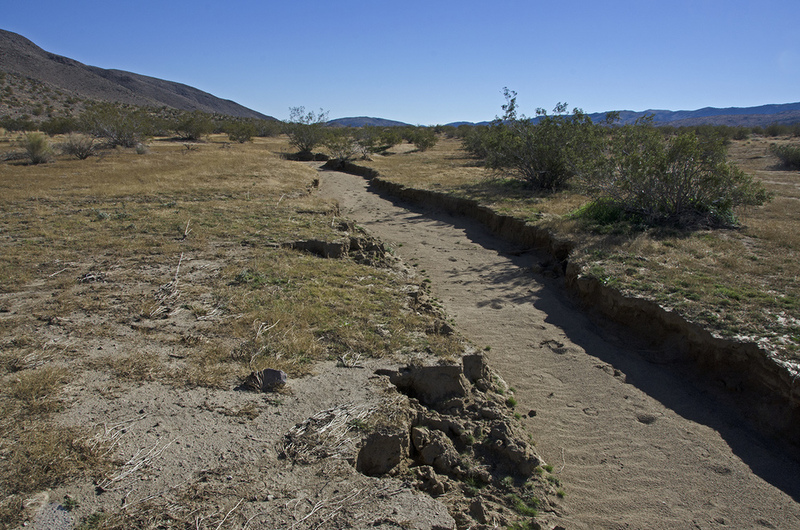 I drove down the Geology Tour Road to the Pleasant Valley Backcountry Board, parked my truck, got my gear together and headed east into Fried Liver Wash. After about 100 yards, I went back to the truck and got some more water. I'd be glad later that I did. 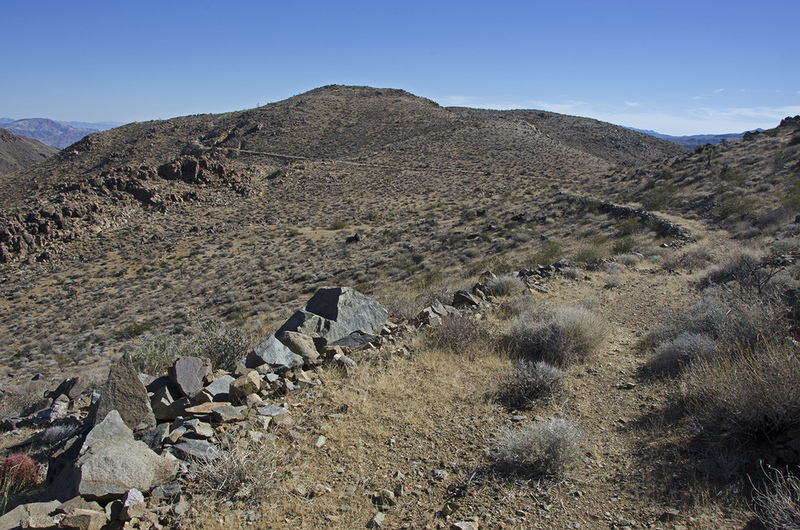 The first 2-1/2 miles in, I must admit, is a very pleasant hike. 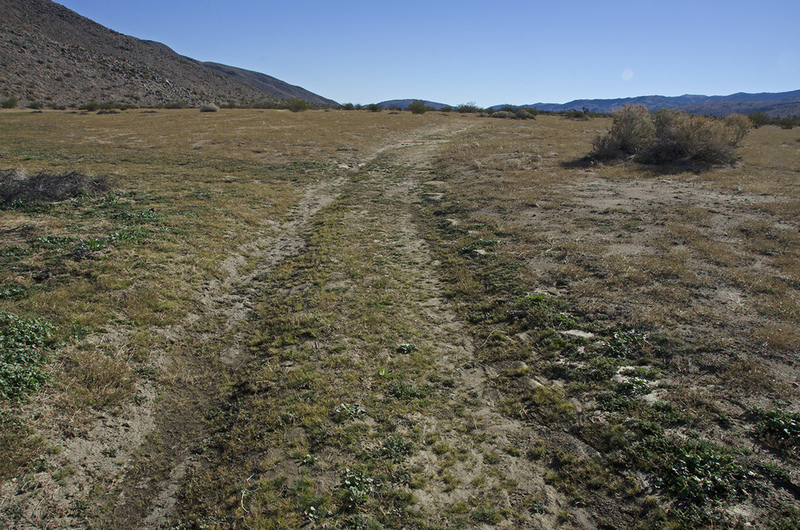 Much of the trail actually follows the old Pleasant Valley Road, and where it disappears I just followed along the wash, keeping the southern base of the Hexie Mountains just off to my left. 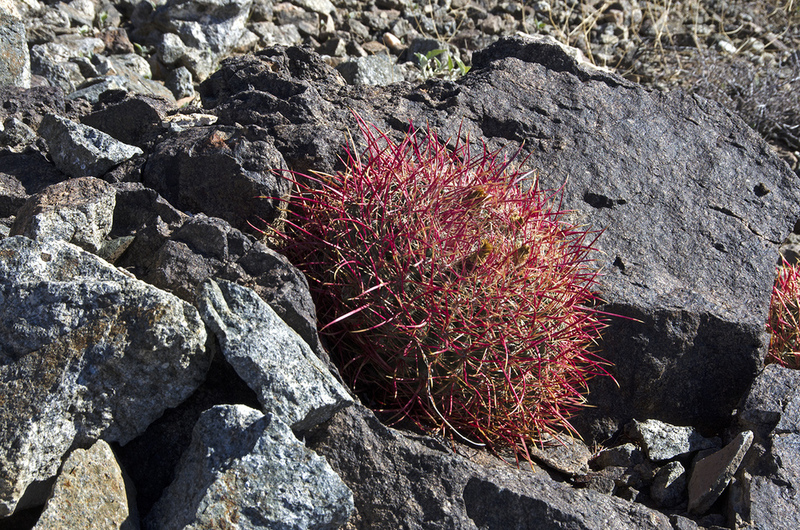 There are a lot of mines in the Hexie Mountains and I was sorely tempted to veer off and check them out, but prudently decided to save them for my return trip. 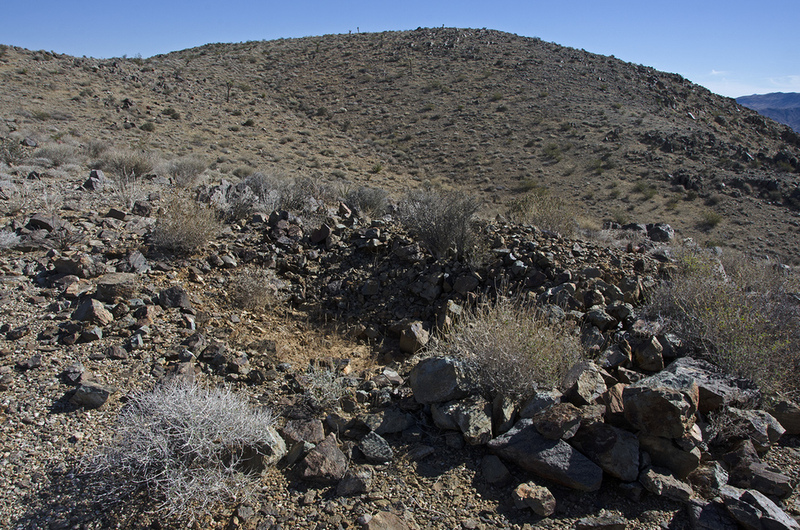 My GPS helped me find the spot (33.91619 -116.01019) where an old wagon road begins its northward, zig-zag course up over the top of a high ridge on its way to the Hexahedron Mine. Once again, as I hiked up that road, I marveled about the men who built such roads. 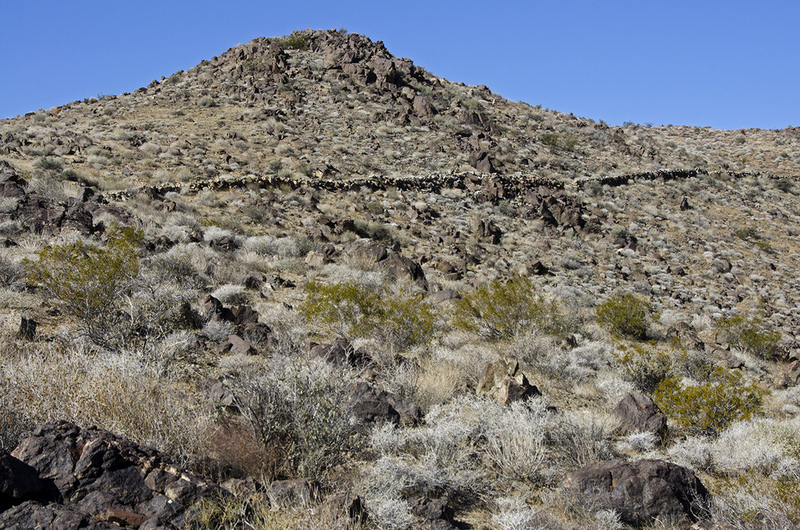 Much of the 2-mile-long road has a rock retaining wall on its downslope side, to keep the road from sliding down the mountain during heavy rainfall. It must have taken a long time to build this road. I also wondered if it was any smoother when it was first built, because today it's extremely rocky in many places. 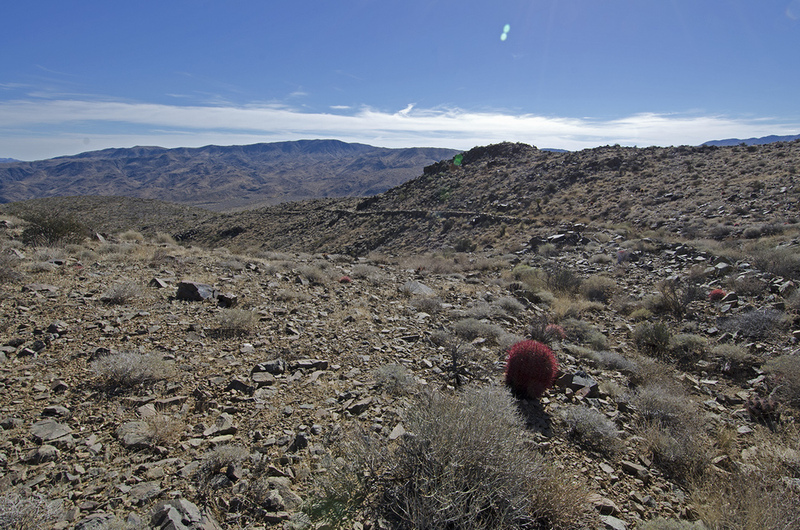 There are some great views along the road, looking out over Pleasant Valley and Fried Liver Wash. 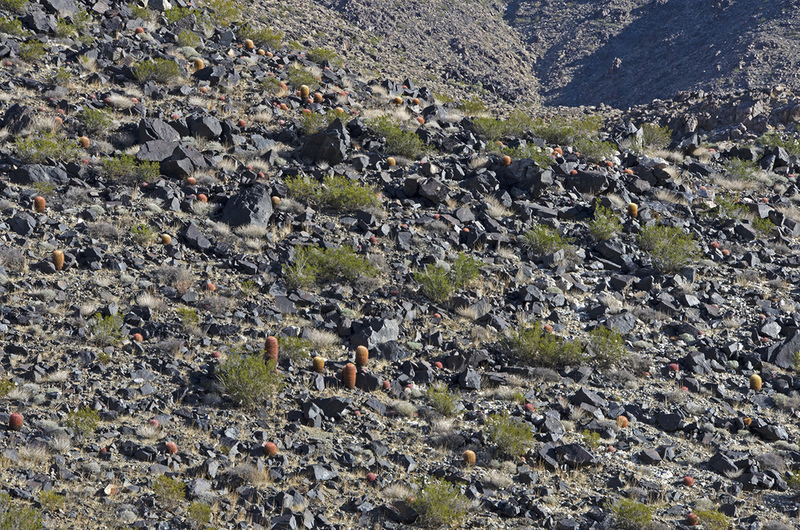 The trail gains approximately 850 feet elevation over the two miles to the mine, and even though the weather was cool, I was glad I had brought the extra water as it saved me from attempting to cut open any of the red barrel cactus and steal their moisture (I've only seen that done in movies). When I finally rounded the last bend and had the mine in my sights, I gave a sigh of relief as the rest of the way was slightly downhill. Within another five minutes I had reached an old stone ruin, which was my main objective on this trip. I had seen a picture of it and thought it was pretty cool. The hike from the registration board to the mine took me a little over two hours and my tracking app calculated my distance traveled at 5.43 miles, but I don't think it was actually that far, probably closer to 4.5 miles. And worth every step. 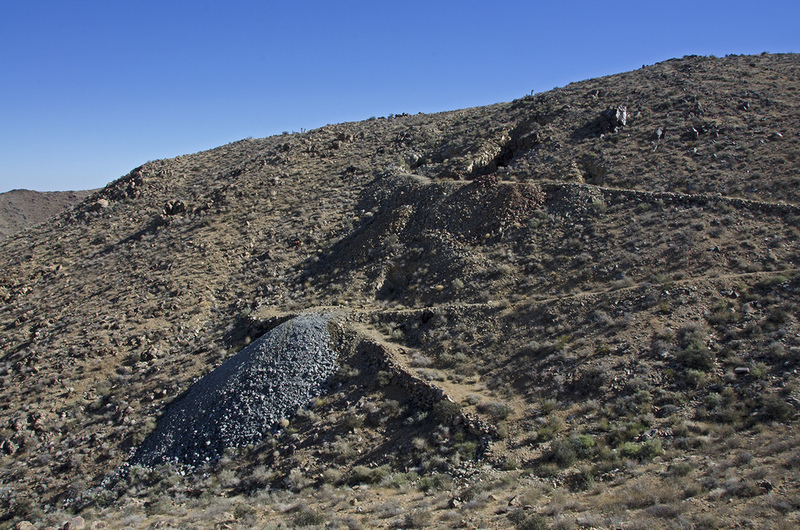 There isn't a lot of information available on the Hexahedron Mine, but according to the scant traces I was able to track down, the mine had its beginnings sometime in the early 1890s. 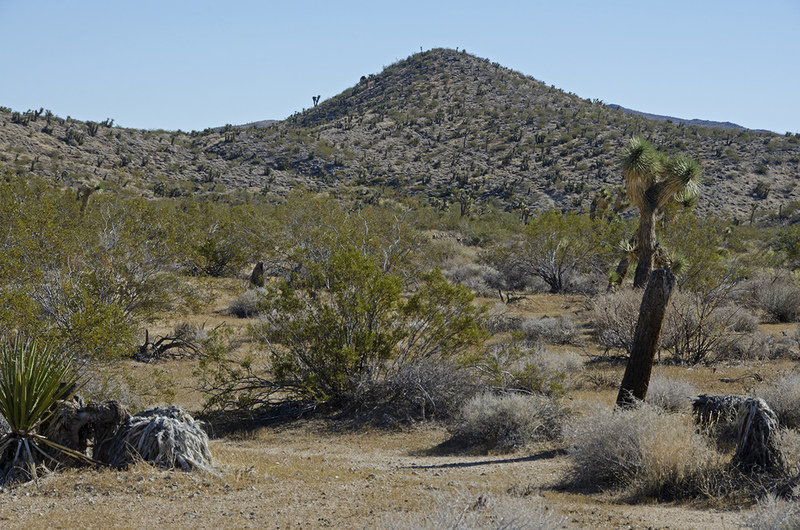 Many of the famous names in J Tree history have been tossed about in relation to this mine: Jep Ryan and his partner Kelsey (of the Lost Horse Mine); Tingman and Holland of Indio; and Bill and John Garrison who apparently formed the Hexahedron Mining Company. 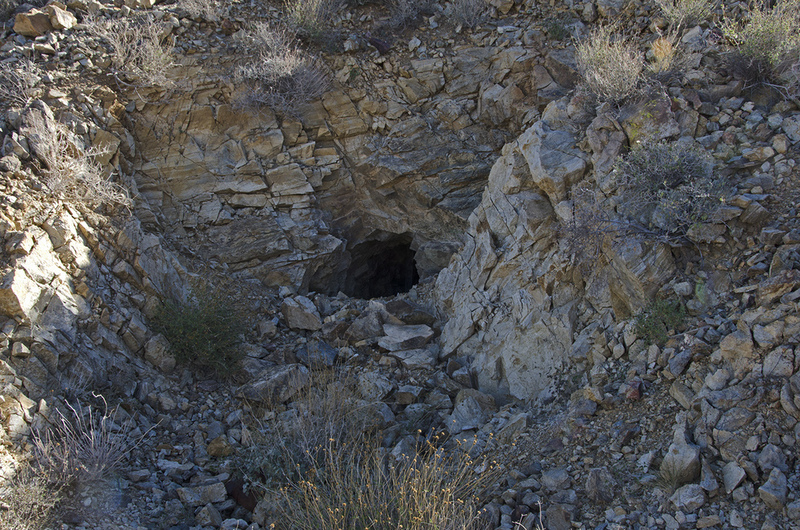 The mine was reportedly active in 1907 with a crew of twelve men and mentioned in another report as being owned by the Indio Mining and Milling Company in 1915-16. Rumors of a mill either on site or down the mountain exist, but by 1929 the mine had been abandoned and the mill had been dismantled. The major problem at the location was the lack of water to work the ore; a well had been dug but it never produced enough water for mining operations. 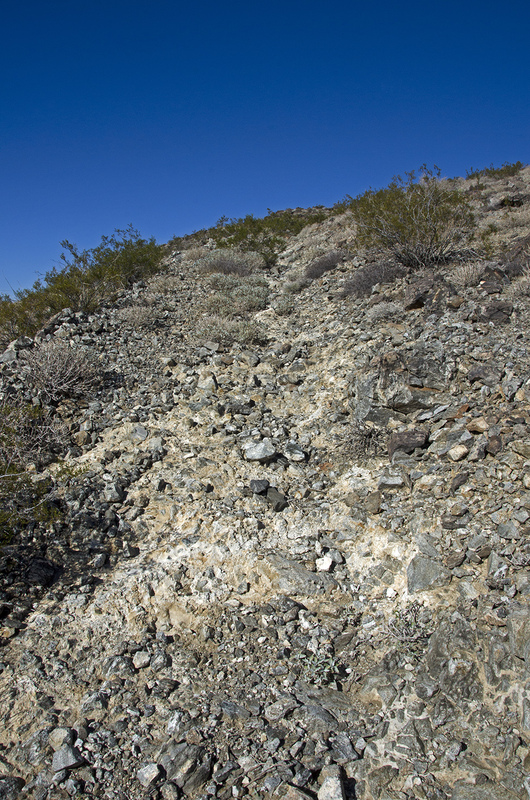 The pile of tailings is quite substantial below the principal working at the mine, a 300-foot drift with one 30-foot crosscut. Higher up the hillside above the drift are three open cuts, a couple which have adits leading into the hillside a short distance. These have been gated to prevent entry. 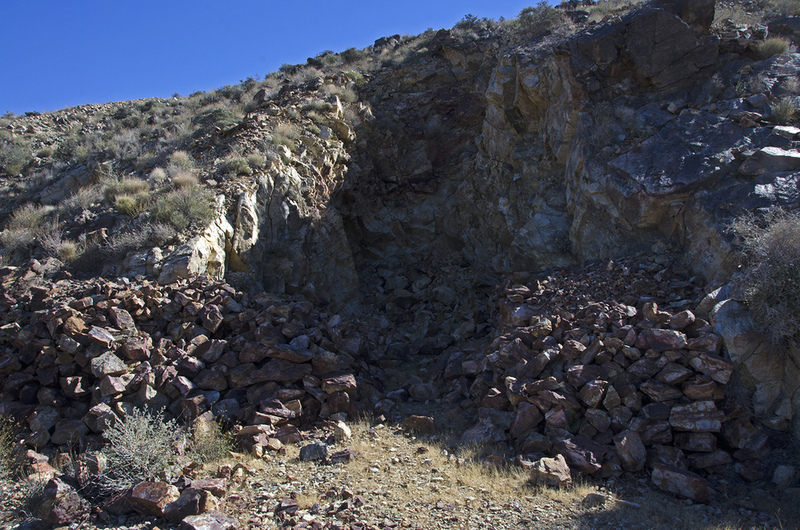 There are also a number of other shallow prospect pits in the surrounding area. 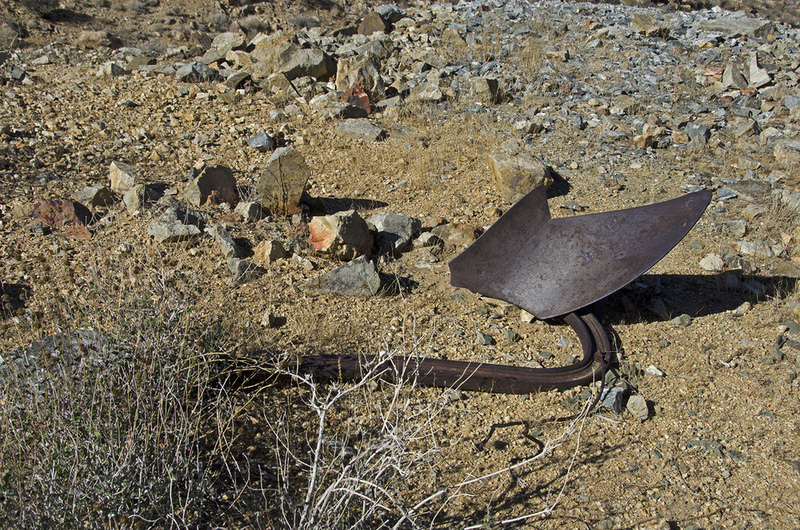 The only substantial piece of equipment I found was what appeared to me to be some kind of plow, or trenching tool, perhaps used in construction of the road. It was very heavy. My favorite part of the whole complex was the ruins of an old rock house. It was built using dry stone masonry and wooden timbers and measures about twelve by fourteen feet. Two openings for windows are still present. There is a pile of broken lumber in front of the house, possibly from the missing roof. I'm guessing this house was probably the mine office/home of whoever was in charge. I'll bet it was fun to be inside back in the mining days, with a thunderstorm raging all around and the rain beating down on the wooden roof. Cozy by the wood stove. 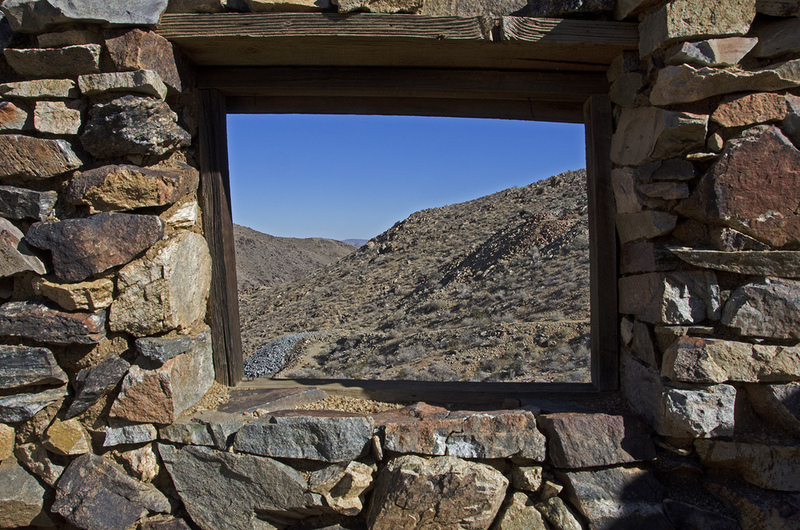 I love finding these old ruins in the desert and this one was definitely worth the trip. 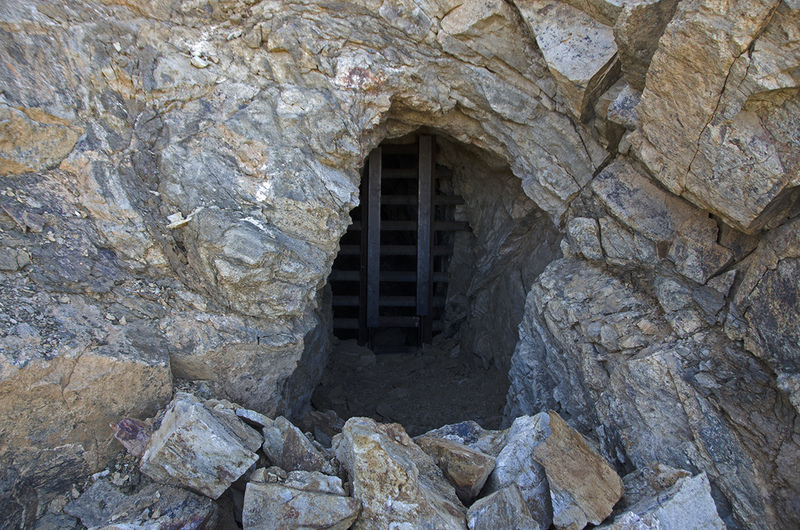 The only known record of gold production for the Hexahedron Mine was in the year 1893, when the U.S. Bureau of Mines listed the placer production from the Hexahedron at 116.68 ounces of gold. 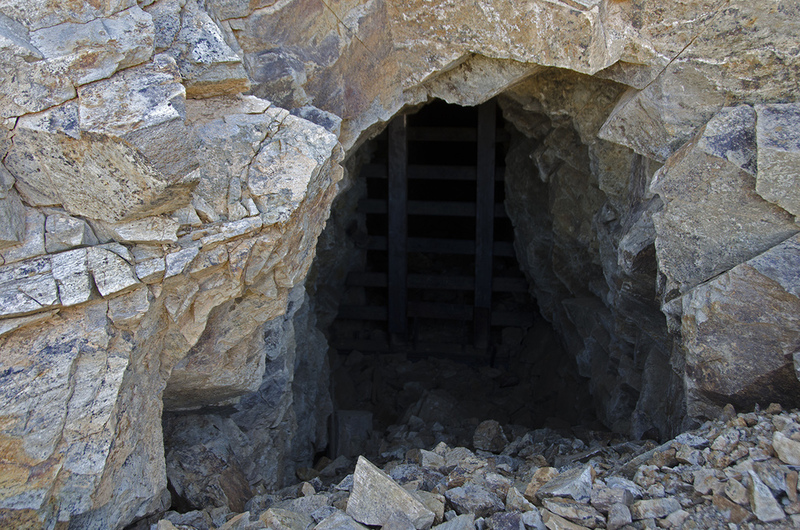 One of the most intriguing things about the mine are the rumors of there being a mill associated with it. Reportedly of good size (5-stamps), and active operation, there is virtually no mention of it in any mining journals and so far as I know, no evidence of where it may have been located. Maybe some day I'll run across its foundations, but that will be on another trip. After exploring the area, taking a lot of pictures and having a quick snack, it was time to head back down the mountain. 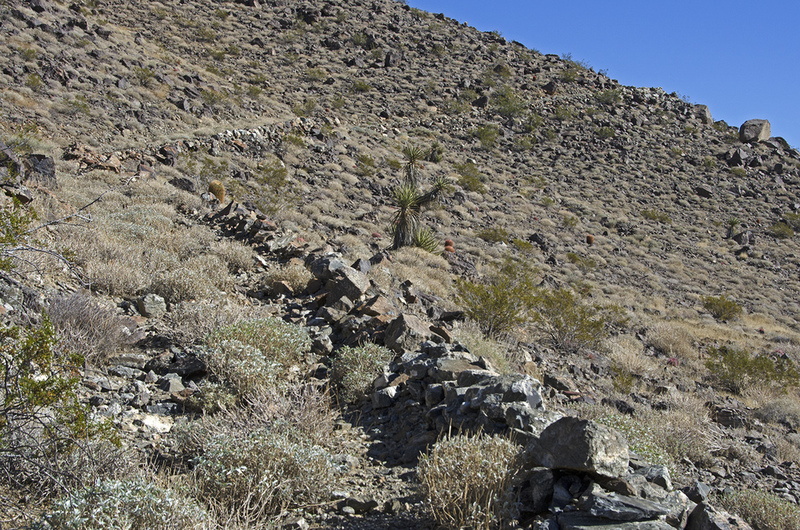 It's almost always quicker hiking down a mountain than it is going up, but with the rocky condition of the trail and the risk of twisting an ankle, I took my time and made it down in one piece. 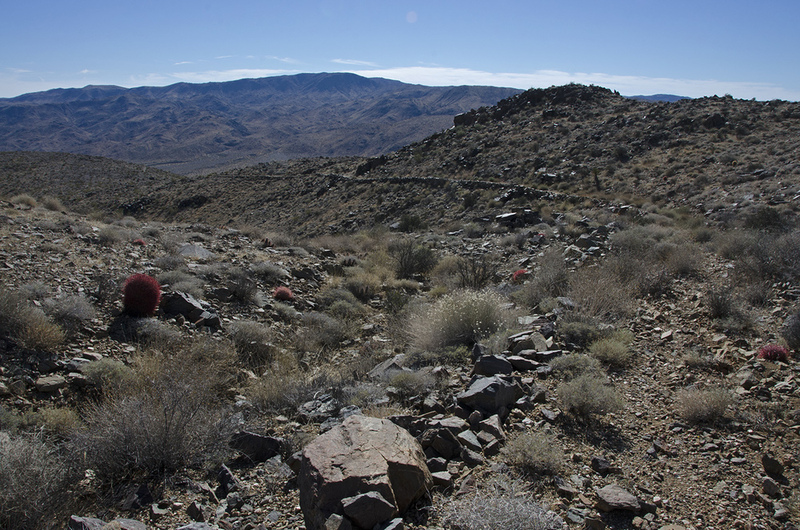 I almost saw my first Mojave desert tortoise on the trail down, I say almost because I'm pretty sure there was no one home in the shell I passed. 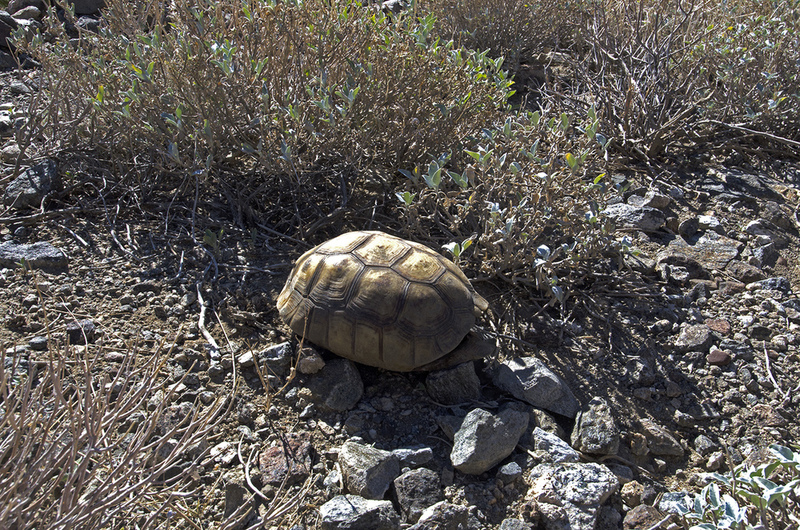 I couldn't really get a good angle to see inside the shell and I wasn't going to disturb it if the owner was present, but it looked like this tortoise had lost the race. 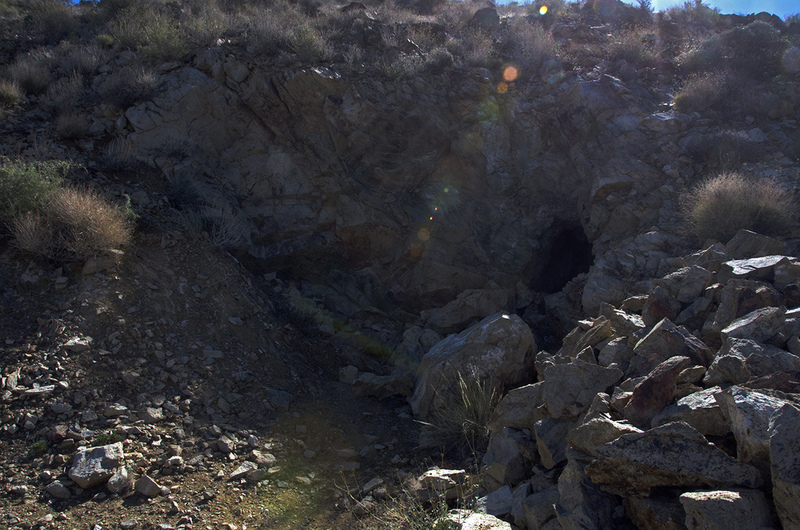 On the way back to my truck I took a few detours and investigated some of the mines along the base of the Hexies. I'll be writing another post on them in the near future, as I think many of them tie in with the Gold Galena (Gold Coin) Mine and Mill. 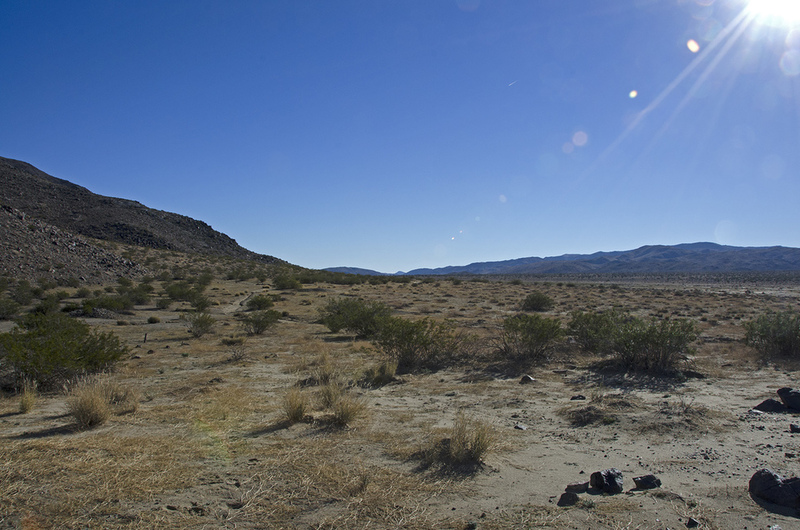 I've heard rumors that Pleasant Valley and Fried Liver Wash are haunted, but I didn't see or feel anything otherworldly during my hike, except for the peace and quiet, the desert solitude of the backcountry. 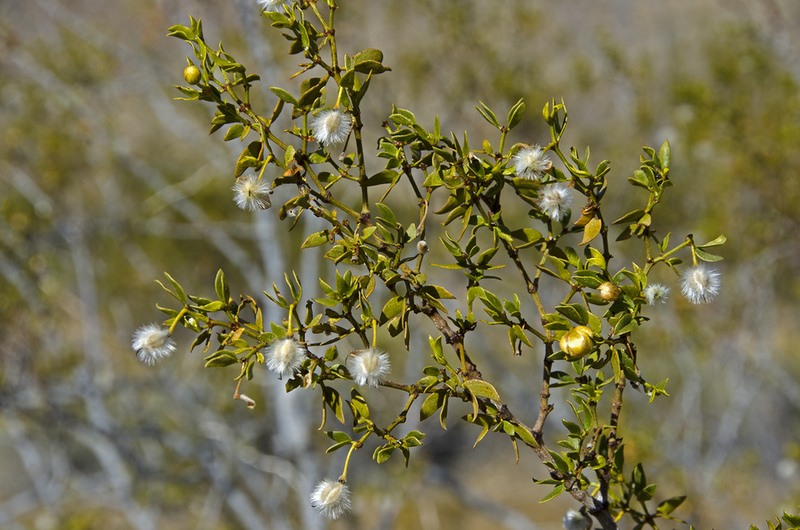 That's always one of the things I enjoy when I go out to see what I can find. Endomondo tracking app on my phone provided me with this trail track. I don't think it's calibrated just right, as it put the total miles traveled one way at roughly 5.5; I think the distance was closer to 4.5, but it still shows the route fairly well.